Cameron Clay is an egotistical little man who, in his selfishness, envies the rich and the powerful. But he does have one unique talent, he’s a gifted journalist and has utilized his skills to become the most widely read columnist in New York City. 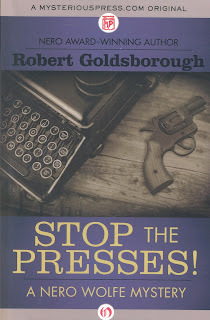 His daily column, “Stop the Presses,” is a glorified gossip feature he uses to attack corrupt politicians, crooked cops and even his own ex-wife for having had the temerity to leave him. Clay sees himself as the champion of the average man who must labor for the pleasure of the social elite. Thus is verbal attacks are constant and brutal. In short he is a fellow many would like to see dead. Which is where Nero Wolfe and Archie Goodwin enter the story. Len Cohen, the newspaper writer and friend of the pair, goes out on a limb and implores Wolf to grant Clay an audience. The irascible columnist has been receiving threatening phone calls that have him convinced he is the target of a would be killer. Against his better judgment, Wolfe acquiesces to Cohen and allows Clay to visit his brownstone office and put forth his case. The meeting between the two is one for the records as Wolfe, by some herculean task, endures Clay’s ramblings and from them gleans that nervous journalist suspects one of five people as the unknown caller. Wolfe begrudgingly tells Clay to either go to the police or hire a bodyguard. Both options are refused and Clay exits in a huff. Several days later he is found in his home with a bullet hole in his head. After a search of the premises, Inspector Cramer of the NYP calls the death a suicide, though no note is found at the scene. Reading the account in the papers, Wolfe and Archie see it as a conclusion to the entire sordid affair. Alas they are proven wrong. The publisher of the newspaper Clay worked for is convinced his popular staffer was murdered and hires Nero Wolfe to investigate. In his typical, methodical fashion, the heavy set, beer-drinking detective sets out to investigate each of the five people the dead man had claimed to be capable of murder. Once again Robert Goldsborough delivers another fine Nero Wolfe puzzle and throughout plays fair with the readers. As the suspects appear and tell their stories, clues are dropped and the challenge as always is to solve the crime before Wolfe does at the traditional office gathering in the finale. 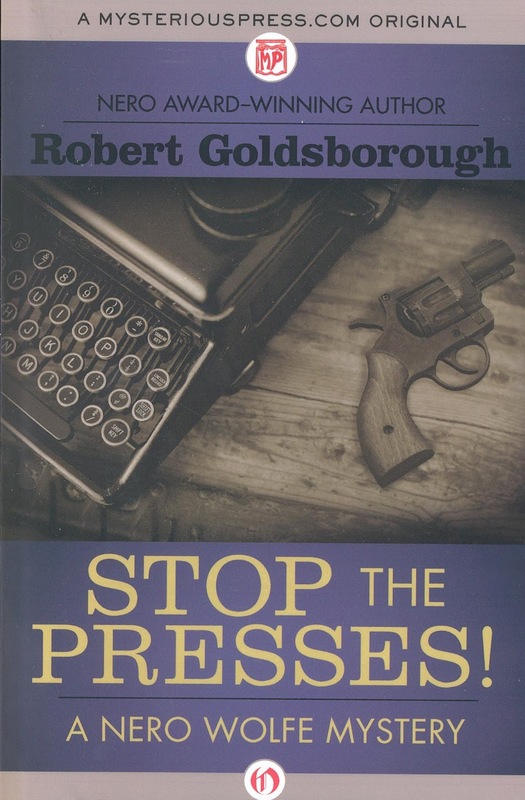 Goldsborough ability to capture Archie’s voice is brilliant and each of his books would have made creator Rex Stout smile. This one sure had that effect on this reviewer. Henry Thompson has a deep abiding love for cities. He sees them as the true salvation of mankind with each giant Gotham moving progress forward via both science and art. That is why he works in Suitland, home to the United States Municipalities Survey, an organization devoted to the improvement of cities. When the biggest of them all, Metropolis, comes under the attack of a maddened terrorist, Thompson is sent there find the villain and stop him by any means possible. Before he can adequately come to grips with the assignment itself, he then learns he will have a partner named Owen to accompany on his mission. All well and good until he discovers Owen is the name for the company’s computer A-I and has no corporeal physical being. Owen is connected to Henry via a sophisticated tie-clip which can project both Owen’s voice and an image construct allowing other people to both see and hear him. Only Henry knows Owen really isn’t there…for real. In “The Municipalists” author Seth Friend has created a humorous action buddy story that envisions a world where machines are gradually taking over the world in very subtle ways. Enough so that the underlying foundations of the futuristic utopias Henry has always applauded may actually conceal a corrupt core adept at exploiting the poor and downtrodden. In the course of their adventure throughout the super city after the fanatical terrorists, Henry’s naïveté experiences a soul shaking education; one that will leave him changed forever. 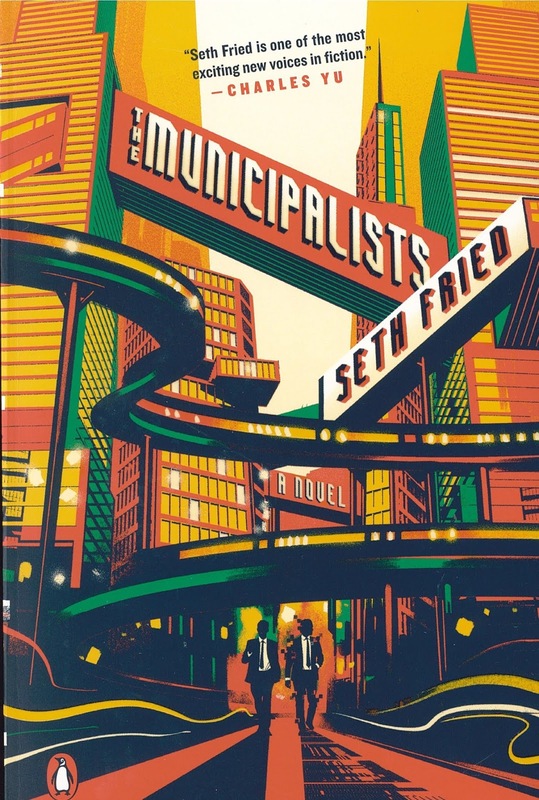 “The Municipalists” is both eye-opening and entertaining. Two traits every good science fiction novel should contain. This one has them both in abundance. On an alternate Earth, a brutal ice age dominates the planet and four months a year, the human population hibernates in order to survive. A pharmaceutical company named Hiber Tech has developed Morphenox, a drug that induces dreamless sleep. Thus an individual, after bulking up with fatty foods, can sleep away their winters. Now to keep these thousands of slumberers safe there is the Winder Consuls; or for want of a better designation, Winter Police. Charlie Worthing, a young man raised in a government orphanage, is recruited as a Winter Consul and sent to the most remote sector of the empire. There he discovers a mixed-bag of non-sleepers. Apparently Morphenox isn’t always one hundred percent safe and he learns that a small percentage of users awaken early…brain dead. They’re called the Nighwalkers and having little or no cognitive capabilities, are trained in doing repetitive menial task. If they are unable to function even at this animal level, they are deployed; i.e. terminated and their body parts sold. Then there are the insomniacs who refuse to take Morphenox and prefer to endure the frigid times as best they can without succumbing to mindnumbing boredom. There are also entire clans known as Villains, who live out in the country and also refuse to take part in hibernation. Among them is the legend of a Winter monster known as the Gronk. The Gronk seeks and out targets that are “unworthy” and eliminates them while singing Broadway showtunes. This quick introduction to Winter leaves the naïve Charlie afloat as he tries to discern who among his new acquaintances is telling him the truth and who are carrying out their own secret agendas. All of which center around the rumored possibility that there exist a viral dreamscape that connects people via their dreams. 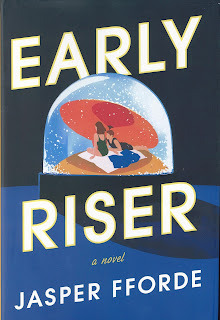 Jasper Fforde’s tale is strange, original, funny and totally captivating. At its core is the essence of good vs. evil, reality vs. dreams and how they can easily become confused in a landscape that is devoid of both natural and human warmth. 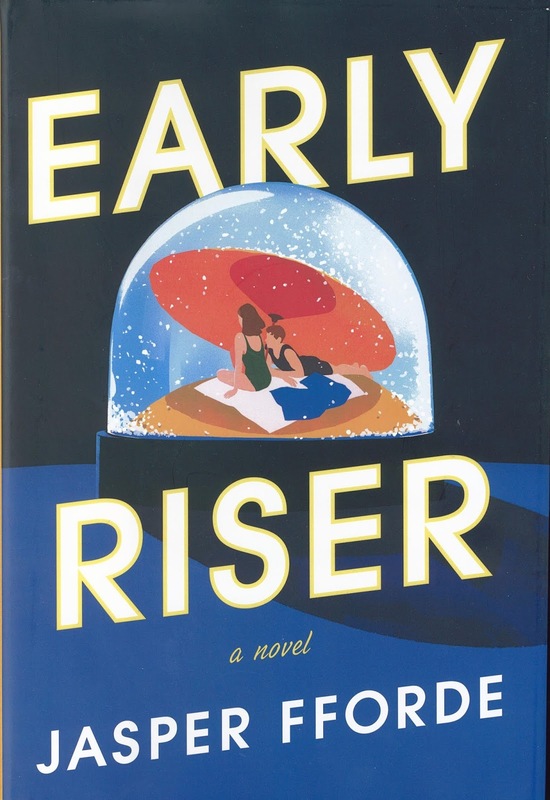 “Early Riser” is both mesmerizing and unsettling. In the end it is a reading experience the reader will remember long after the last page has been finished. Donnie Waits and his single mother, Kate, have moved to a different town three times in the past three years. Now, in their newest home, Kate has landed good job at a meat-packing plant while Donnie has it a whole lot tougher. He’s about to start his senior of high school as the dreaded “new kid in town.” Having settled in during the last few weeks of summer, Donnie has made friends with Nate, a black Vietnam veteran who lives by himself and operates a rundown bait shop by the river. One day, Donnie borrows Nate’s skiff for a leisurely row. As the boat is moving under an overpass, Donnie is startled when a car above him comes to a sudden stop and then a small black bag is dumped off the bridge to land at his feet. As the unseen auto speeds away, Donnie opens the bag to find a small, black puppy. And from that moment on, Donnie’s life is changed forever. Whatever typical feelings of teenage angst and loneliness he harbored are soon dispelled with his having to care for the orphaned dog. At first his mother is reluctant to let him keep the furry mutt, but soon she too is swayed by its natural charm. When school begins, Donnie, soon finds himself embroiled in as yet another alien landscape through which he must traverse. Like every other high school, this one comes equipped with jocks, elitist popular kids, nerds and the usual coterie of brutish, cruel bullies. Malcom, an overweight sci-fi fanatic becomes one of his first allies and then he meets Goth girl, Neely, who begins to stir his awakening manhood. There are also the Barnes brothers, the bullies, whose sole purpose in life is to make it miserable for everyone else they meet. 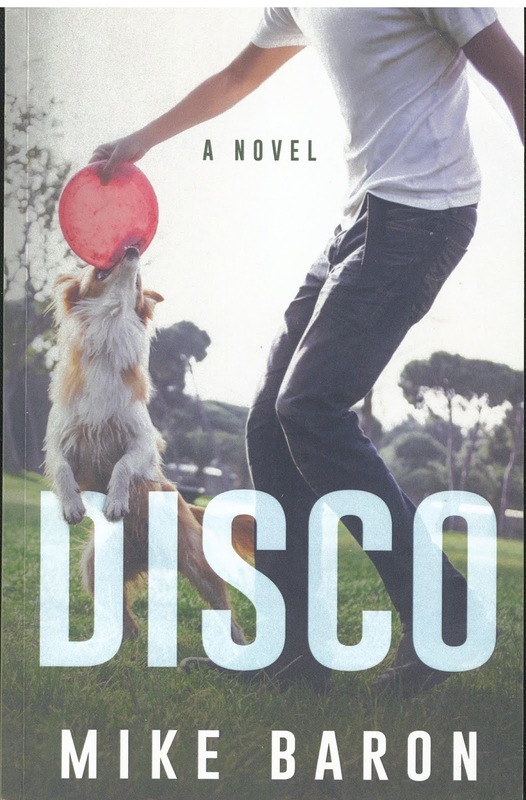 And as if all that wasn’t enough to keep a teenage boy occupied, he discovers his mother has started dating her boss, an amiable fellow named Frank who owns the company; Werner Meats. Sadly, the outfit is on the verge of going under due to steadily falling sales. The dog, which undergoes several different names, eventually displays an overly enthusiastic ability to jump high on command. Having discovered the sport of Disc Dogs; organized contest wherein dogs must run and jump, while performing amazing gymnastic moves, to catch a thrown Frisbee. Donnie christens the black four-legged flier, Disco and starts training him to compete. Known for his action packed comics and gripping horror novels, writer Mike Baron reveals a new side to his fabulous imagination with “Disco.” While reading it, we couldn’t help but marvel at how deftly he captured the world of today’s high school students as they struggle to leave behind the innocence of childhood and deal with the burdens and responsibilities of adulthood. There are dark moments in this story and they are handled with true insight and compassion. This is a coming of age tale filled with believable, wonderful characters both noble and evil. It deserves a huge audience as it has all the earmarks of a true American classic. Do not miss it. Books by one’s favorite writers are always a welcome treat for any reviewer. Whereas we’ve enjoyed Max Allan Collins work over the years, we always do our best to be honest and truthful with these reviews. 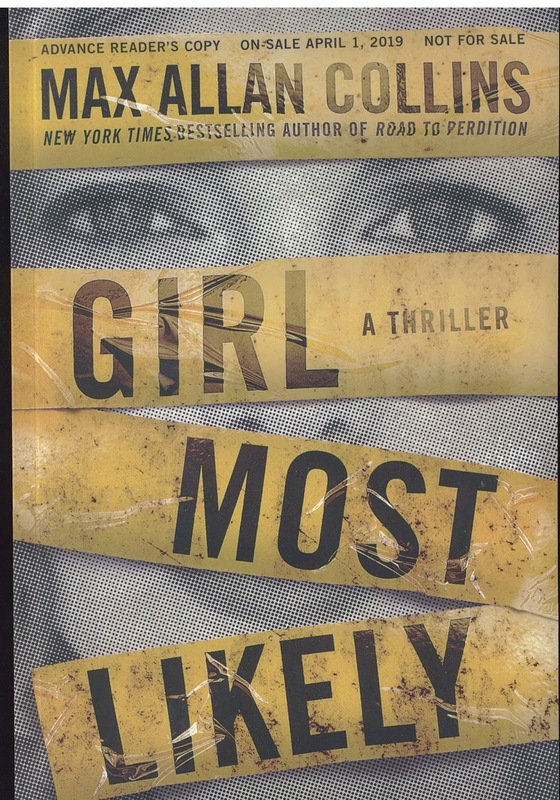 Have no worries, dear readers, Collins once again delivers a resounding homerun knocking the ball way-way out of the park with “Girl Most Likely.” In it are all the elements that make up the majority of his work; suspense, likeable characters, skillful pacing and a liberal dose of humor. Krista Larson is the police chief of the Midwest tourist town known as Galena. At twenty-eight, she also has the distinction of being the youngest chief in the country. We soon learn that she followed in her father’s footsteps. Nntil his retirement, Keith Larson, was a detective in nearby Dubuque. With the passing of his wife from cancer, Keith accepts his daughter invention to “move back home” and so as the book begins he is awkwardly getting settled into the house where he and his late wife raised their only child. Meanwhile, Krista is making preparations for her tenth high school reunion to be held at a nearby lodge. Like most sane people, she is ambivalent about attending and having to see people now part of her past. Oh, there are friends she hopes to reconnect with, plus those students who remained in Galena. She maintained close relationships with several of these. It’s pretty much the “out-of-towners” that she’s concerned about. 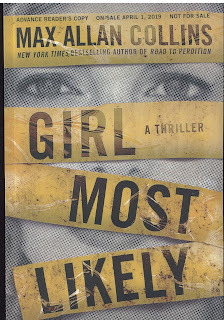 One such is Astrid Lund, “the girl most likely to succeed” as labeled in the senior yearbook. She went on to become a celebrity journalist for a Chicago television station. Astrid’s appearance at the reunion has the entire community abuzz. What they don’t know is the dark secret Ms Lund is harboring and how it is one of the primary reasons for her return. When Astrid is brutally murdered hours after the reunion dance, Krista Larson is handed her very first murder case. Even though she is confident in her own abilities and those of her small staff, she wisely recruits her father to act as an unofficial consultant on the case. With his assistance, and her own natural “cop” instincts, the two soon suspect the murderer is in fact a member of the Class of 09 and the motive lies with Astrid’s long-kept secret. As always, Collins’ attention to details is magnificent. Although police procedure is for the most part universal, there are obvious differences in approach. A big city homicide division has a great deal more resources available to it than those of a small town police department. It is this realistic view of Krista and her team’s operations that wins our applause. The mystery unfolds at the perfect pacing and in doing so builds each layer of suspense until the reader is unable to put the book down. Now the finale, while fitting, left us a wee bit unsatisfied. The end comes and the stage curtain drops…wham. Whereas we’d just spent a few hundred pages with Krista and her dad, an epilogue would have been welcomed here. Still, that is a minor quibble and indicative of the fact we’d very much like this to become as yet another Collins series. Please, Max, more. Hell hath no fury like an Ice Goddess tricked. Here’s hoping you’ll forgive my twising the Bard’s famous phrase to kick off this review of Van Allen Plexico’s latest entry in his grand space saga. Karilyne is the beautiful goddess of ice and steel who enjoys her solitude. When a fellow god, Cevelar, accompanied by a human, General Vostok, come to her for help, she unwittingly falls for their lies and soon finds herself imprisoned in a foreign castle and her mighty battle axe stolen. Through the assistance of a strange little techno mage, Karilyne and her human aid, Mirana, escape only to learn Cevelar and Vostok are seeking six cosmic weapons of incredible power with which they hope to resurrect a dead god of chaos. Karilyne’s axe is one of the six artifacts required. But she knows their insane plan will ultimately bring about the destruction of the entire universe. They must be stopped and she will have her revenge. Soon they are joined by two female Templar knights and a giant gray warrior, all agreeing to serve Karilyne for the duration of her mission. The group begins to travel the varied dimenions of the Three Levels upon which reside gods, humans and aliens. When Solonis, a whimsical god possessing a time traveling machine, joins them, the action kicks into high gear. Soon our heroes are flung from one reality to another. They even witness the all consuming future entropy; if Cevelar and Vostok are successful. Once again, Plexico creates memorable characters, each distinct and original. He then drops them into wondrous settings rich with imagination. His world building is clever and mesmerizing, pulling the reader into these myriad realms effortlessly. If you’ve read his earlier books in this saga, you already know what fun awaits you. If you are just now discovering the series, do not wait another minute before opening this book; what awaits inside will blow your mind!! Two of science fictions’ most often used plots revolve around time travel and alternate worlds. Whereas this book merges the two conceits in a twisty, compelling story that is nothing short of brilliant. The tale opens in the early 1900 hundreds in a world where the Irish Empire rules, Anglia is subservient, there is no America but rather the Mexica republics and the rumors of war are a constant threat around the globe. Aine Lasairfona Devereaux, the Queen of Eire, desires peace but is incapable of devising a practical strategy to insure it. 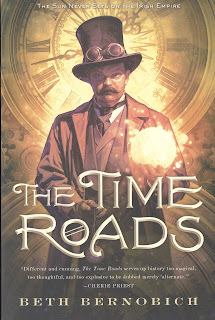 Then Breandan O Cuilinn, a genius scientist, comes to her saying he has discovered the existence “time fractures.” These anomalies could lead to time travel if examined carefully. Such journeys to the future could be the means of avoiding the coming international conflicts. Then, before he can successfully prove his theory, O Cuilinn disappears in an experiment gone awry. Queen Aine suspects he has trapped himself in the future and once again she finds herself beset by plots and conspiracies. At this juncture in the narrative, Bernobich shifts our attentions to Simon and Gwen Madoc, two sibling mathematicians who may have come across the “time fractures,” much to their detriment. Their discovery proves to have disastrous effects on their immediate surroundings. Gwen is institutionalized with a mental breakdown and a mysterious serial killer begins murdering Simon’s fellow students. Alarmed by these murders at one of the country’s most prestigious universities, Queen Anne sends her personal bodyguard, Commander Aidrean O Deaghaidh, to investigate. All too soon he too is caught up in the flux of changing timelines, which leads to his questioning his own sanity. And that’s only the first half of the book. “The Time Roads” is a complex, enthralling tale filled with amazing characters all struggling to find their places in an ever changing cosmos. Despite the uncertainty of each new future that challenges them, they learn to rely on the inner strength that is their true, immutable constant. That human love and loyalty, despite their many failings, will in the end triumph. A tip of the pulp fedora to Beth Bernobich for a truly unforgettable adventure.